The best way to sum it up is Cotone Vineyards is/was a hobby that got way out of hand. Like most things we started small growing grapes then more grapes then more grapes.....you get the idea. Soon it the hobby transformed into this community focused farm. We grow grapes, apples, raspberries, strawberries and turn them all into jam and jellies.. We also grow pumpkins, hops, and all other sorts of assorted types of vegetables. We also make our own Maple and Shagbark Hickory syrups. On top of all that we also make our own pastas. All these wonderful things we bring with us to market. My name Is Matthew McMullen and along with my wife Lynn we have been working hard for the past five years toward our dream of one day running a sustainable small scale vineyard and farm. 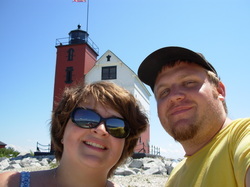 In the spring of 2009 we purchased our home and land in Birch Run, MI with the intentions of starting to fulfill that dream. Since then we have poured all our spare earnings from teaching into constructing the vineyard and building/purchasing the equipment necessary to maintain the vineyard. With the little funds we had and the help of our family, neighbors and community we were able to get where we are today. Grapes and farming are nothing new to either of us. My wife’s family roots are deeply entrenched in grape growing. Her great-great grandpa came from Italy and planted some of the first vines in the area. In fact the picture below is my wife’s great grandpa and great-great grandpa meeting with Michigan State University researchers at their family vineyard before grapes were even being grown on a large scale in Michigan. For myself, I learned most of what I know about farming growing up around my family’s farms. I guess you could say I was not a normal child; when I was younger I used my sand box to plant field corn and soybeans. That passion for providing from the land has never really left me. When I first started dating my wife I was introduced to her great grandpa who took the time to show me every aspect of growing grapes and making wine. I developed a passion for grapes and wine making. When Lynn and I married we had a goal of building a vineyard and farm and continue her family’s heritage and mine, and that is exactly what we have done since 2009. We purchased our property in the spring of 2009 with the intention of building our vineyard and possibly one day expanding to something more. We had a hard time though naming the vineyard. I have to admit that I pushed for a name, although my wife kept asking why? I told her to look around, all the other farms in the area where named, and we are in every aspect a farm, right? We thought about naming our vineyards as most of the area farms are named, using our last name but that was "typical" and we did not want that. We thought about our heritage, me being Polish/German and her being predominantly Italian/German. So we played around with some Italian and German names, none of which we liked, and all lacked a uniqueness. So then we began looking for ideas. One of us had commented on a book we had purchased some time before called Wine Dogs. It was a collection of short writings and beautiful pictures of the dogs of Winery and Vineyard owners. A light bulb went off! We turned to our Golden Retriever (mix?) Cotton. Everything about her personality explained what we wanted in our future endeavors. 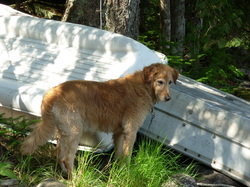 She was calm, easy going, relaxed, playful, and is a dog that truly enjoyed life and pleasing people. That was what we wanted, to enjoy life and make people happy. We then played around with the name a little. We didn't want to name the vineyard Cotton Vineyards because people not close to us would think....of everything but our wonderful dog. So I said what if we follow my wife’s heritage and spell Cottons name in Italian, It would force people to ask what’s Cotone? Our name was born. Cotton herself is now about 7 years old and is not the only dog in our house. We also have a black lab, Hershey. Both love to play and enjoy life and pleasing us. Both love to walk the property with us and chase whatever animals they see along the way. If you are ever at the vineyard chances are you will see one of them somewhere around walking with Lynn or myself.